The situation at Fukushima Daiichi remains dire, partly for administrative reasons. TEPCO, Tokyo Electric Power Co, which owns the plant and is handling the containment/cleanup, has subcontracted the job to 400 different companies, with no overall project management. There are 7-8 layers of subcontractors, each layer taking a rakeoff from the huge amounts of money being poured into the site by the Japanese government. Although the site was nationalized in June 2012, TEPCO remains in charge. The Skilled Veterans Corps for Fukushima - SVCF- has called for a new law removing TEPCO from the job and putting the site under national control. Their petition follows the news item about gangsters, who control about a third of the subcontracting companies, we have been told by a member of SVCF. Pressure from the US to take care of this is needed, so please sign and disseminate the petition above. The SVCF petition must be printed out and mailed in- also very helpful. Criminal organizations are cashing in on the disaster that shook Japan nearly two years ago by sinking their claws into all aspects of recovery operations to skim off handsome profits. “The recovery operations involve a lot of money, so they are a godsend for gangs that have trouble making money due to a police crackdown on gang activities,” a gang insider said. See also: Police make arrest over cleanup workers at Fukushima Daiichi -- Crime syndicate "allegedly participated in containment work for the damaged facilities"
Work at the Fukushima Daiichi Nuclear disaster site continues under dangerous conditions. The Skilled Veterans’ Corps for Fukushima (SVCF), an incorporated public-interest organization of seniors (60 and over), was established to volunteer their services, based on engineering and other technical backgrounds, in order to reduce radiation exposure for young workers. They are moreover convinced that continuing to entrust the project to TEPCO is hardly acceptable as a solution. 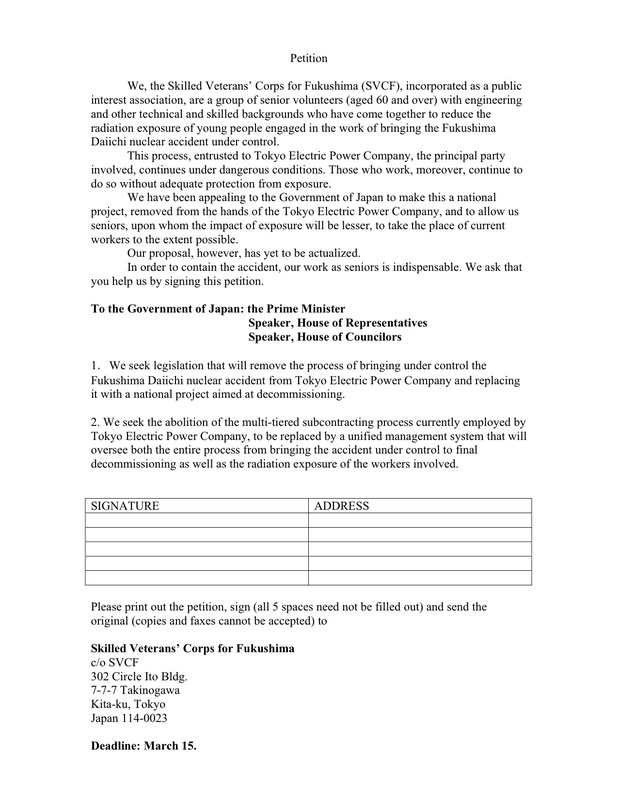 They have appealed to the Government of Japan to turn this into a national project in which the entire process, from bringing the disaster under control to decommissioning, as well as worker safety for the duration of the process, will be overseen by a unified management. Their proposal has yet to be realized. They are now seeking signatories to a petition to be submitted to the Government in mid-March.